Reimagining India: Unlocking the Potential of Asia’s Next Superstar. 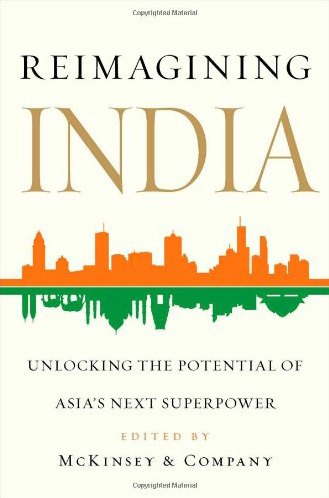 The Diplomat’s Justin McDonnell speaks with McKinsey & Company’s Adil Zainulbhai, about the firm’s new publication Reimagining India: Unlocking the Potential of Asia’s Next Superstar. How did Reimagining India come about? The dialog about India around the world had deteriorated significantly and was being driven by headlines. We wanted to have a broader and more positive dialog about India that highlighted the issues but also the opportunities, and suggested ideas for achieving India’s potential. We believe 65 different voices writing short essays would help reach a wider audience. We were fortunate to bring together an unprecedented group of leading thinkers from around the world to write, which was very exciting. Two years ago, McKinsey & Company’s Japan office did something similar with Reimagining Japan successfully. Among the array of essays in your book, you’ve included contributions from a classical dancer and a chess master. Could you tell us a little bit about their insights and how they reimagine India? There is a dedicated chapter of nine essays on “India’s soft power” which discusses cricket, chess, food, and dance. The authors talk about the huge goodwill that these art forms have created for India by their global acceptance. Viswanathan Anand, past chess champion, talks about his drive to get more people in India interested in taking up chess and how he has succeeded. Harsha Bhogle describes how it took 15 years of low performances by India to emerge as a genuine cricket superpower. Jerry Pinto describes how Bollywood is popular and impacts the life of Indians around the world. India has been poised to become the world’s next global power as it has experienced unprecedented growth and stability over the last two decades. Yet, there has been cause for concern that India’s growth story has stalled and rising expectations have been premature. What are some of these deep fault-lines and domestic developmental challenges that are curtailing India’s economic prosperity? There have been many challenges of governance, bureaucracy, poor fiscal management on the economic front; and of a lack of progress on social dimensions of health, education, women’s rights, environmental concerns, etc. Many infrastructure projects were stalled due to red tape, poor governance and corruption. In addition, there is the continuing debate on whether there is a trade-off between growth and inclusiveness and are the benefits of growth only reaching a few people rather than all the 1.2 billion people. India also has a large pool of young people coming into the workforce. This can potentially be a demographic dividend if they get productively employed and help grow the economy; on the other hand if they are unemployed, then they can drive social disruption. Many of the authors are optimistic in the long term, as many of these issues are starting to get addressed. Technology can help leapfrog developments in education, health care, financial inclusion, etc. The experiments going on in the 28 states show that inclusive growth is possible, and these states are learning from each other. The growth story may be more in the states where Chief Ministers are emerging powerful rather than in the center. Parliamentary elections are set to take place later this year between the ruling Indian National Congress and the opposition Bharatiya Janata Party (BJP). What are some of the factors that will influence Indian voters? What will the next government need to do to restore faith in state institutions? In 2014, first-time voters will account for almost one-third of the electorate compared to five years ago. These young voters grew up in an India reveling in near double-digit growth rates. They have high aspirations and are looking at a party who delivers versus the old caste- and religion-based voting. What moves the young voters to act is unpredictable, and anyone who taps into this group can disrupt the current structure. In the Delhi elections, Aam Aadmi Party (Peoples Party) ran on an anti-corruption campaign and did extremely well. So, as with any democracy, it is difficult to predict elections until people vote. The business community is hoping that the new government will make the regulations easier, and investments by business will increase. The current government has already taken a number of steps to get the growth going again, so this will also help boost the economy in the next 12 months. Are you optimistic about the development of India-China relations? Is Asia large enough for both the elephant and the dragon? Both India and China realize that to improve the lives of its citizens, they need peace and economic growth. Both countries have successfully attempted to reignite diplomatic and economic ties. They’ve worked collectively to keep conflicts down and work on issues cooperatively. Trade between the two countries has grown significantly. In the last seven years, India has lifted 140 million people out of poverty, and China has become the number two economy in the world. Both realize the importance of stability in building better lives for their citizens.